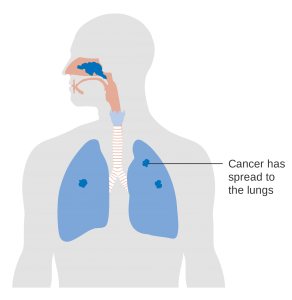 To get to know all the details regarding the lung cancer, such as it's symptoms, Prevention, Treatment or cure, you can read the whole article with the help of this article you can get the all details about lung cancer..All the details about lung cancer are given below.. Smoking cannabis has also been linked to an increased the risk of lung cancer. Don't Smoke : Smoking is the leading cause of lung cancer, which is responsible for 80 to 90 % of lung cancers. Check your home for radon : For non-smokers, checking your home for radon is the number one thing you can do for lung cancer prevention. Be Careful and aware at work : It's estimated that that up to 29 % of lung cancers in men are related to on the job- Job exposures to cancer causes substances. Be Careful and aware at home : Lung cancer prevention is most important at home as well. Chemicals that contribute to lung cancer are found not only at the workplace but may be under your sink or in your garage. Do Exercise for lung cancer Prevention : To avoid lung cancer is necessary to do exercise at least twice a week.